The first electromagnet, invented in by William Sturgeon. Hans Christian Ørsted was a Danish scientist and philosopher that discovered the unique relationship between electric currents and magnetic fields. 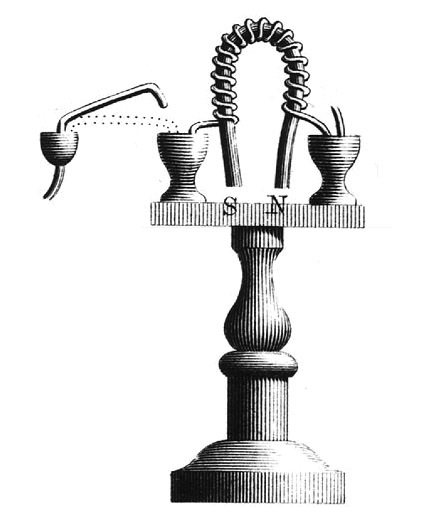 Ørsted had been investigating electric and magnetic properties for several years, and in 1820, while preparing for an experiment during a lecture at the University of Copenhagen, he noticed a compass needle, which happened to be lying next to a wire circuit, moved when he switched the electric current on and off. He had found evidence of a direct connection between electricity and magnetism. A few months later after more intensive investigations, he published his discovery that an electric current produces a magnetic field as it flows through a wire. Soon after, there was a tremendous outbreak of research in this new field of electromagnetism, and in 1824 the British scientist William Sturgeon invented the electromagnet. Today, electromagnets are used in a variety of ways, from electric motors, transformers and generator to electromagnetic suspension for MAGLEV trains. One of the early uses for this new technology was in stage magic. The French master magician Jean Eugène Robert-Houdin used a powerful electromagnet in one of his most famous tricks, The Light and Heavy Chest. Robert-Houdin brought a small wooden box on stage and declared that he had found a way to protect it from thieves. He would then ask a small child to lift it, which the child would do with ease. Then he would pick a full-grown man from the audience and ask him to lift the chest. And try as he might, the man could not lift the box. What was unknown to the audience is that the chest had an iron plate embedded in its based and under the stage was a powerful electromagnet which the magician could turn off and on by a hidden switch. What made this trick even more incredible is that Robert-Houdin used it to help squelch a rebellion in French Algeria. In 1856, after his retirement, Robert-Houdin was asked by Napoleon III to help pacify the Marabouts there. The Marabouts were able to control their tribe with their “magical” abilities and had advised their leaders to rebel against the French. Napoleon wanted Robert-Houdin to show that French magic was more powerful. Robert-Houdin used The Light and Heavy Chest trick by inviting the strongest tribesman on stage and asking him to pick up the wooden chest, which he did with ease. Then Robert-Houdin announced that he was going to take his strength. Waving his wand he declared, “Now you are weak.…Try to lift the box.” The tribesman laughed at this and struggled with all his might trying to lift the chest, but it would not move! Then he tried to rip it apart, but the box had been rigged to give an electric shock when he tried to rip the handles off. Screaming in pain, the tribesman let go of the chest and ran out of the theater. After his performances were done, he visited with the tribe leader and was given a scroll professing the tribes loyalty to France and praising his magical powers. Robert-Houdin went back to France with his mission accomplished, having suppressed any possible rebellion.